Max Richter, hailed as a “modern-day musical genius” by the New York Times, kicks off the 2018-2019 Candler Concert Series on Friday, Sept. 28, performing with the American Contemporary Music Ensemble. Photo by Rahi Rezvani. 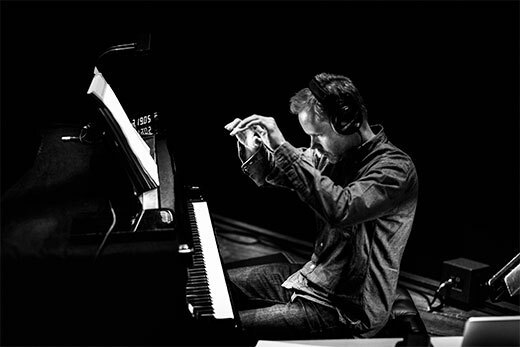 The 2018-2019 Candler Concert Series kicks off its 16th year in the Schwartz Center for Performing Arts on Friday, Sept. 28, at 8 p.m. with Max Richter and the American Contemporary Music Ensemble performing “Infra” and music from The Blue Notebooks. Hailed as a "modern-day musical genius" by the New York Times, Richter has become best known for his genre-defining and highly influential solo albums which are seen as "landmarks" (The Independent, Pitchfork) of the ever-burgeoning neo-classical movement. Joined by the American Contemporary Music Ensemble, New York's "contemporary new music dynamos" (NPR), the North American Tour 2018 will feature his work “Infra,” inspired by T.S. Eliot's “The Waste Land,” and selections from the enhanced reissue of his 2004 masterpiece album, The Blue Notebooks. Richter’s sonic world blends a formal classical training — he graduated from the Royal Academy of Music and was a pupil of renowned composer Luciano Berio — with modern technology. His achingly beautiful works have made him one of the most prolific of contemporary musical artists, with a monumental collaborative output also encompassing concert music, operas, ballets, art and video installations, and multiple film, theater and television scores. The American Contemporary Music Ensemble (ACME), led by Artistic Director Clarice Jensen, is dedicated to the outstanding performance of masterworks from the 20th and 21st centuries, primarily the work of American composers. The flexible ensemble presents fresh work by living composers alongside the classics of the contemporary. ACME's dedication to new music extends across genres and has earned them a reputation among both classical and rock crowds. ACME was honored by ASCAP during its 10th anniversary season in 2015 for the "virtuosity, passion, and commitment with which it performs and champions American composers." The Candler Concert Series is made possible by the Flora Glenn Candler Endowment, bringing internationally-renowned artists to Emory University's Schwartz Center for Performing Arts. Candler artists range from large ensembles to solo artists from a wide variety of musical genres. All concerts are presented in the Emerson Concert Hall of the Schwartz Center for Performing Arts (1700 N. Decatur Rd., Atlanta, GA 30322). Tickets are available through the Arts at Emory Box Office online at arts.emory.edu/box-office, in person, or by calling 404-727-5050 Monday – Friday, noon – 6 p.m. The Schwartz Center for Performing Arts is dedicated to providing performances and facilities accessible to all. Accommodation requests should be made at least 24 hours in advance of the event to the Arts at Emory Box Office at 404-727-5050 or by email at boxoffice@emory.edu.